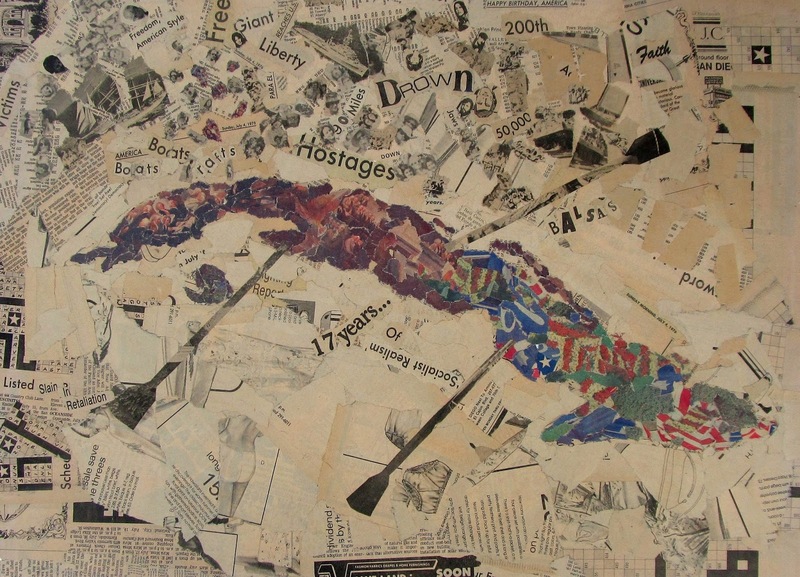 His piece in the exhibit is made from a newspaper dated July 4, 1976, and has as its central focus the island of Cuba. Campello told CNS that if he had stayed in Cuba, his art would be controlled by the government there because it dictates everything, including what constitutes art work. "It would have been my work with an approval stamp by some bureaucrat in the communist dictatorship," he said. The artwork was his proposal for admission to the University of Washington School of Art in Seattle, where he studied. A newer piece by Campello in the exhibit is titled "Running Towards Freedom (Heading to the New American Embassy)," showing a young Cuban girl running away from her country to freedom. "She has left everything behind, naked, and there is nothing but light in front of her and she is leaving all the darkness behind," he said. Read the whole article by Ana Franco-Guzman in the Boston Pilot about the Looking Glass: Artists Immigrant to Washington exhibit at the Katzen Museum here. By the way, that collage (see below), which was part of The Andres Fernandez Collection in New Jersey, has been gifted to American University!